Facebook and Zynga’s post-IPO performances may have scared many companies off public markets for the time being, but liquidity is still available to certain smaller, private companies. 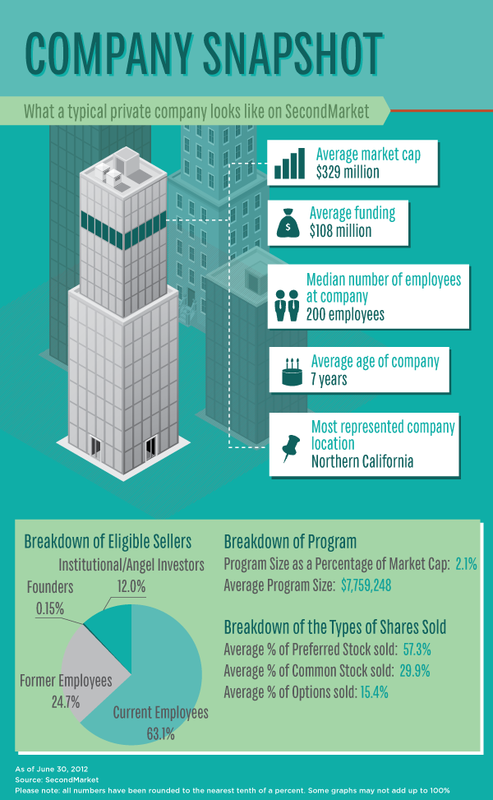 SecondMarket took a look at the privately-held companies that continue to offer shares on the marketplace and found that they have an average valuation of $329 million and about 200 employees. 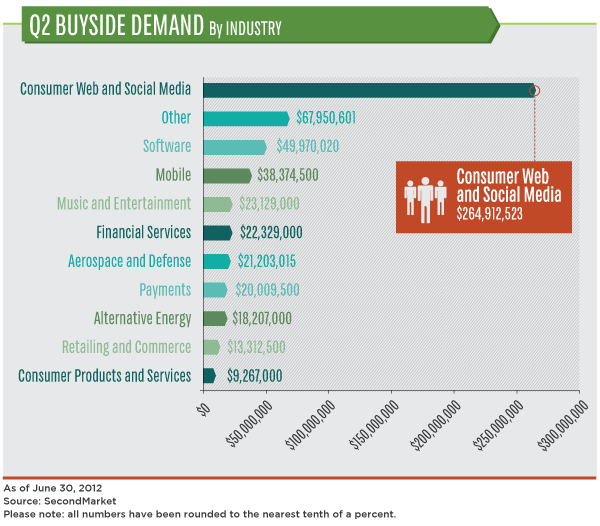 SecondMarket’s full report is here. Even with headwinds from the public markets, transactions on SecondMarket’s platform in the first half of this year are still up 27 percent year-over-year at $341 million. 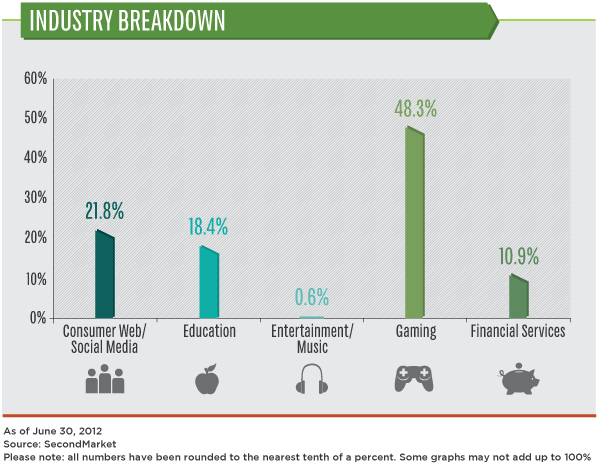 Gaming companies led the way with 48.3 percent of liquidity events on the platform. (Really, that doesn’t seem that surprising considering how Zynga has slid from a privately-held valuation of more than $14 billion before its initial public offering to a current $2.2 billion market cap.) Privately-held gaming companies are likely to feel a great deal of downward pressure on their valuations throughout the next several months. Following gaming companies were consumer web and social media companies, then education and financial services. In terms of buyside demand, investors were most interested in consumer web and social media startups with $265 million in interest. Enterprise software saw $50 million in interest, then mobile startups saw about $38 million in demand. Among younger companies, Sean Parker and Shawn Fanning’s video chat startup Airtime attracted the most new interest from investors in terms of followers. Unfortunately, the company hasn’t really had the cultural impact that the duo’s other work has so far. Airtime currently has 100,000 monthly active users, according to app tracking service AppData. 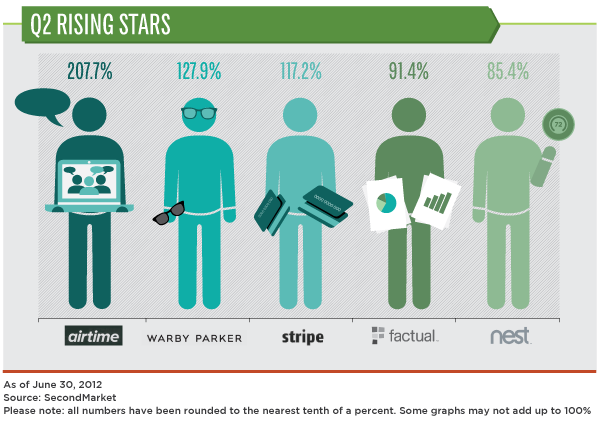 Following Airtime is the eyeglass e-commerce company Warby Parker, which was also a rising star from last quarter. Similarly, Y Combinator-backed payments company Stripe also made another appearance. Factual and Nest follow them. 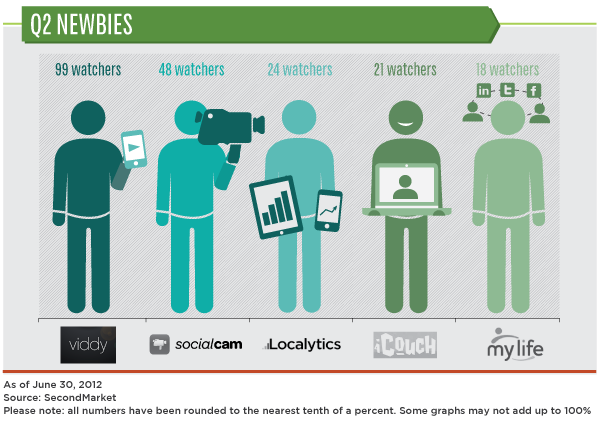 The video-sharing startups topped the list of newbie companies. Viddy and SocialCam, which was recently acquired by Autodesk for $60 million, led the way. They are followed by Cambridge, Mass.-based Localytics, online psychotherapy startup iCouch and people search startup MyLife.